IF YOU ARE LOOKING FOR TYPICALNESS, STOP, YOU ARE IN THE RIGHT PAGE! Its taste is sweet and spicy. It leaves inside your mouth a consistent, intense and tasty aftertaste. Take a slice and try it. Its seasoning makes it just perfect! It lasts for 4/5 months, neither one more nor one less, otherwise you run the risk that it is too fresh or too dry. You can notice this slicing it. The slice must be firm and and red, an intense red, which is typical of each of our products. Combine it with a soft cheese, choose a savory one, the spicy of the capocollo will be his impletion to taste a unique savour. 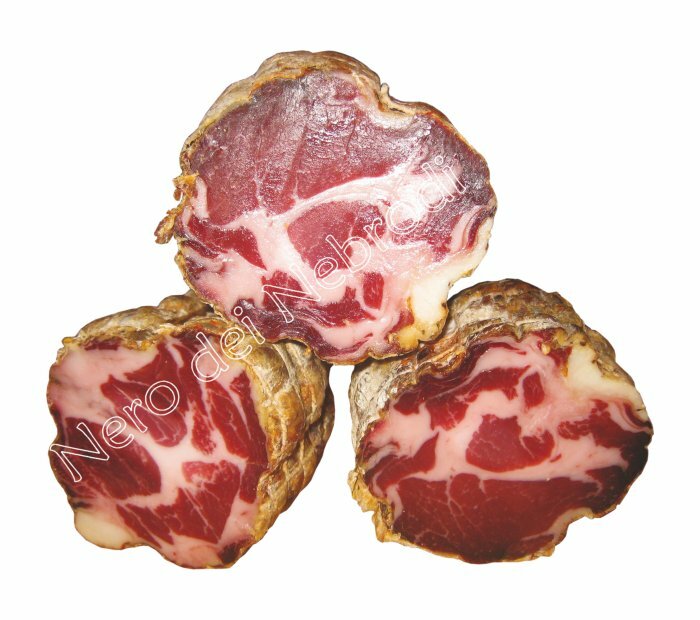 Trivia: It is produced exclusively from the meat of the black pig bred in Nebrodi. It takes its name from the cut of the loin nearest to the head of the pig.